While floriculture can include quite a broad variety of subareas, at Hutcheson Horticultural Company we focus in on the enhancements that can be made possible from floriculture. We pride ourselves in the work that we have designed, installed, and maintained through our floriculture enhancements. Much of our floriculture enhancements include adding exciting color and fragrance to landscaping. We have seen beautiful results from our flowery enhancements in several key areas around residential and commercial landscaping. 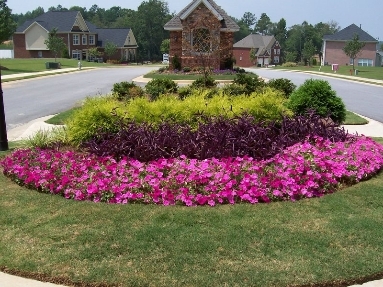 These areas include colorful flower beds along walkways and driveways. In addition, a fragrant flower bed is nice to include near outdoor sitting areas. We specialize in the design and installation of hardscapes such as grill islands, patios, and waterfalls, and these hardscapes really come alive with full color enhancements. Imagine a beautiful border of colorful outdoor flowers surrounding your deck, or your outdoor firepit area. Not only will the colors add a richness to the environment, but the lovely fragrances will be delicious as well. Our floriculture team has handled the design, installation, and maintenance of perennial and annual enhancements. If you are ready to add a little excitement to your landscaping through the additions of color, texture, and fragrance, call us at 770-924-1001 today to schedule a consultation.